Commissions? – Try This Special No-Risk Offer! 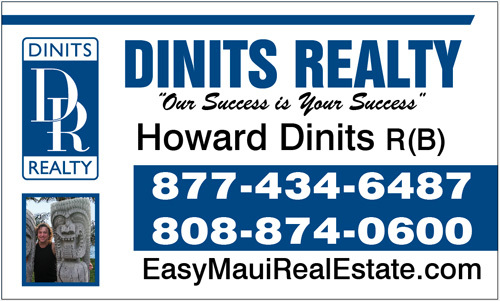 exclusively with Howard Dinits R(B) and Dinits Realty. Most brokers will charge you the same fee no matter how your home sells … even if you find the buyer. In Maui, Hawaii, Kihei, Wailea, Kahului, Walikuku, Lahaina Real Estate Areas. Our professional fee is based on sales price. With a 6% or 7% Listing. Platinum Service Need it sold Fast? Want the best marketing money can buy? Call Howard Dinits 877-434-6487 for details. Our commission is 4% and the buyer’s agent receives 3%. Gold Service Another agent from any office represents the buyer. Our commission is 3% and the other agent also receives 3%. Silver Service You prepare an exclusion list of interested parties on listing contract and we write the contract for you and walk it through escrow. Silver Service You market the property yourself and we write the contract for you and walk it through escrow. SERVICE You find the buyer from the exclusion list of interested parties on listing contract and don’t want our assistance. There is no other agent involved. You pay nothing. Simply put, Howard’s objectives are to get you the most money in the least time; and with the fewest hassles using technology and his negotiation skills.